Feather extensions look good on any head and with any length of hair. Whether you're looking for a classy look or just to add some excitement to your hair, hair feathers can help you do just that. 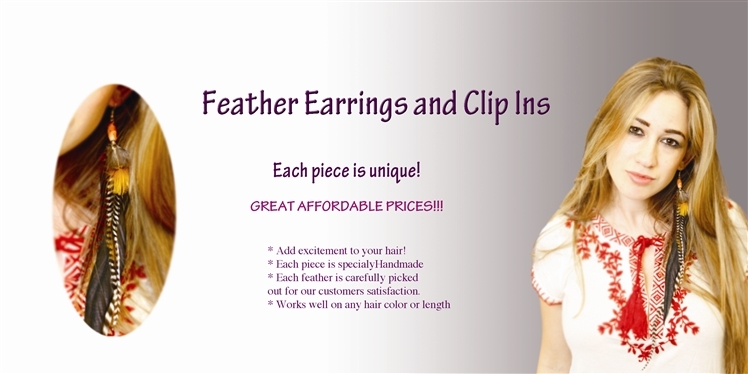 Add that extra spice to your hair with clip in feather extensions or feather earrings. Each piece is original and slightly vary from the next. So start building your collection and be the next hottest thing. Make heads turn. All our feather extensions and feather earrings are top quality and have a shipping time of around 3-5 business days. Works great in all hair lengths & colors. Feather earring, new hip way to add style to your look. Our feather earrings looks great on anyone, instant color and excitement to your hair. Feather extension clips, new hip way to add style to your look. Our feather extensions looks great on anyone, instant color and excitement to your hair. As seen in the malls. 16" Grizzly Feahter Synthetic hair extensions. Please note that although you can still do all the usual styling methods, curl, straighten, wash, blow dry, it is a synthetic feather and therefore you must be careful when performing these methods. Grizzley Real Feather Extensions are made of the 100% real finest ostrich feathers. Our feathers come in a wide variety of colors and patterns. Each feathers range from 8-11 inches. They are as fine as 1mm - 2mm. 100% rooster feathers. You can wash, blow, dry and curl them. Each feather comes with 3 micro rings for installation. Beautiful necklace with a perfect peacock feather. Wear it whichever way you want. Free set of earrings included. Each feather extension and feather earrings are handmade by our specialist and no two feather extensions and feather earrings look alike! Each product is original and unique!